Williams Sonoma sells a cute personalized gingerbread kit! This is one of my favorite traditions that I rarely get to do. I used to do make em when i was lil. I love the peppermint candies as the walkway!! Adorable!! Love it. LOVE it. 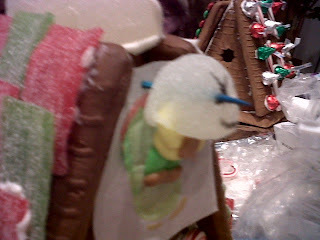 My problem with gingerbread houses was always eating all the candy before I even started building the house! So sweet! 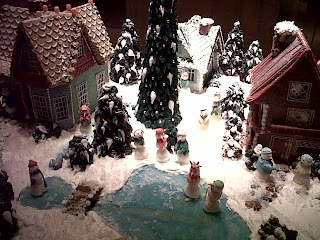 I really want a gingerbread house of my own! How freakin cute are you guys! Aww I really need to make this tradition. I haven't made a gingerbread house in ages! Oh my gosh what a good idea! That is a fabulous tradition to have. The house is beautiful! One would love to make one, would be nice to invite friends over. ps: I used to be a visual-merchandiser for W Sonoma, miss it sometimes. whoaaaa this is so so cool! Way too cute! 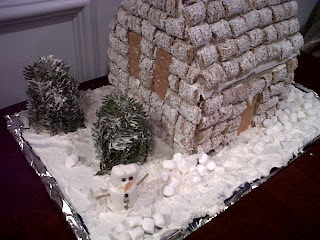 I haven't made one of these since I was like 12... wonder if I could convince the bf to partake in some Gingerbread housing?!?! Adorable - what a cute tradition! Can't believe the one at the Ritz - amazing! We just made ours yesterday... so much fun, and way to much candy eating!!! how fun! 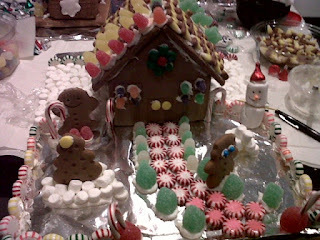 I've never made a gingerbread house before..can you believe that?! I think that needs to change. These look amazing! adorable. Your 11 yr.old boy cousin~freakin riot! So fun! I went to the store this weekend trying to find some and I couldn't at all! I have no idea where you buy sets like that. What a fun way to spend the afternoon. Happy holidays Jaime! What a super duper fun thing to do. Can I come next year? I've got a few good ideas I'd like to try out... hehe. omg...I love love love these! I feel like gingerbread...maybe tomorrow I will get myself a gingerbread latte...yes! Oh my word! These are spectacular! 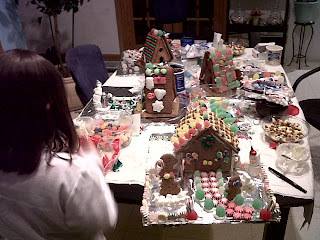 I have actually never made a gingerbread house, but I sure love eating off of them! Looks like sooo much fun ... but ... I would end up eating EVERYTHING! Sooo cute!!! Mmmm I want to eat all those little houses!!! Wow - you guys are soo talented!! This post reminded me of that episode of Throw Down with Bobby Flay - the gingerbread house competition...you would have beaten him for sure!! Wow...such beautiful gingerbread houses. You and your Mom did a fantastic job...Congrats!